Use this vanity to bring more traditional style into your bathroom. The good-looking white quartz counter and black solid wood base make a big difference in your bathroom. The roomy double-door cabinet is great at storing your bathroom must-haves. This classic set from Simpli Home will make your bathroom look brand new. The product is warranted to be free from defects in material and workmanship for a period of (1) year from the date of purchase to the original owner. With a modern look and strong design, this vanity will help any bathroom look nicer. This piece comes with a beautiful black solid wood base and a white marble counter. Put together your perfect bathroom with this stylish vanity set from Avanity. Designed with a traditional style and strong build, this vanity is a perfect choice for any bathroom. Its comes with a nice white marble counter and black plywood base for strength and style. Put away your bathroom items in the double-door cabinet. Put a classic feel in your bathroom with this good-looking set from Bellaterra. Designed with a traditional style and strong build, this vanity is a perfect choice for any bathroom. Its white ceramic counter and black plywood base are very easy on the eyes. It is made with a double-door cabinet to hold all your bathroom items. Put a nice touch on your bathroom's look with this vanity set from Bellaterra. Use this vanity to bring more traditional style into your bathroom. This piece comes with a beautiful black plywood base and a white marble counter. With a double-door cabinet, this vanity can hold all your bathroom must-haves. Put a nice twist on your bathroom project with this classic piece from Bellaterra. Winston 31-inch W 2-Door Freestanding Vanity in Black With Quartz Top in White Use this vanity to bring more traditional style into your bathroom. The good-looking white quartz counter and black solid wood base make a big difference in your bathroom. The roomy double-door cabinet is great at storing your bathroom must-haves. This classic set from Simpli Home will make your bathroom look brand new. 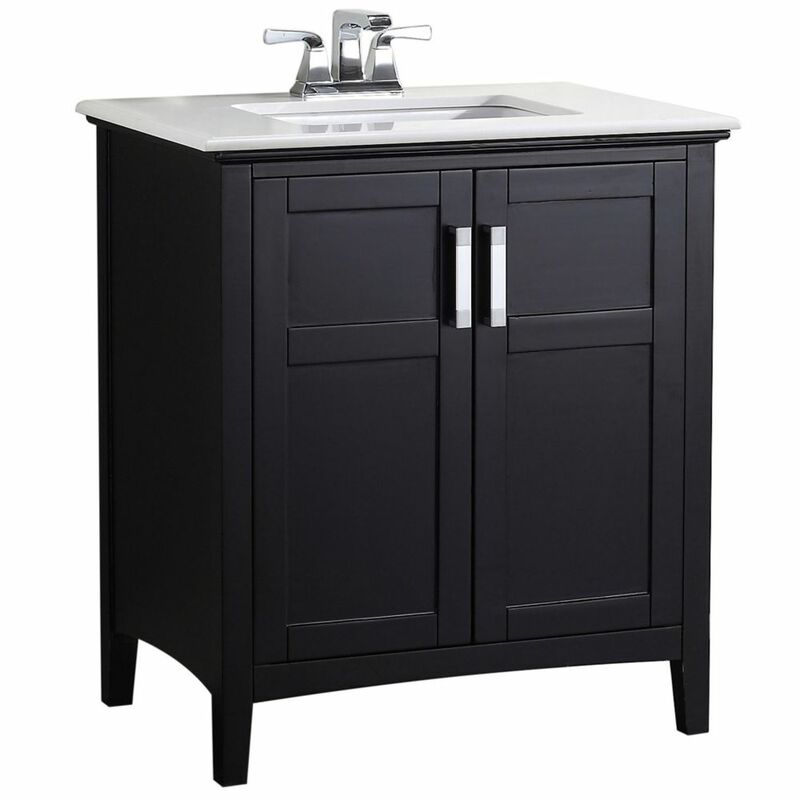 Winston 31-inch W 2-Door Freestanding Vanity in Black With Quartz Top in White is rated 2.3 out of 5 by 3. Rated 4 out of 5 by Darlisa from This looks great and fits in with my existing cabinets... This looks great and fits in with my existing cabinets perfectly. Love it! Rated 2 out of 5 by Gail from There is a small block of wood located at the top inside the doors that is the only thing keeping... There is a small block of wood located at the top inside the doors that is the only thing keeping the doors from completely closing INTO the vanity. This block was broken off. There is a mark on the left door just inside the handle that looks like a greasy streak on an otherwise matte black surface. There is a bubble in the wood above the left door. For the price I paid, I expected a quality item but I am disappointed and I will not recommend it to anyone. The vanity would be a nice look in my bathroom as I expected, but it is damaged.